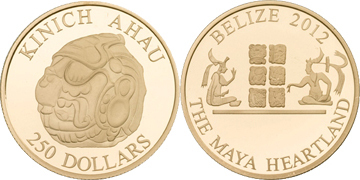 Press Release- The Central Bank of Belize- December 27, 2012- The Central Bank of Belize, in commemoration of the sacred and historical milestone - Maya Mythical "End of the World" 21 December 2012, has commissioned The Royal Mint to strike a limited edition of gold and silver coins. The front of the coin displays drawings from the Hokeb Ha vase depicting the hero twins described in the Popol Vuh (Maya sacred book). The hero twins are in conversation, dressed simply in kilts, necklaces, ear flares and featured white cloth headdresses. The glyphs in the centre of the figures represent the Maya Mythical ‘End of the World’ date. This date, according to archaeologists, completes a ‘great cycle’ of 13 baktuns (periods of 144,000 days each) since the mythical creation date of the pre-Columbian Maya calendar. The back of the coins depicts the Jade Head discovered in a large tomb at Altun Ha, a Maya archaeological site. This tomb housed the remains of an elderly adult believed to be an elite ruler during his lifetime. For the Mayas, jade was the most prized of all stones. The Jade Head remains the largest single carved object yet discovered in the Mundo Maya (Maya World). This exquisite carving represents the Maya sun god, Kinich Ahau, one of the most important deities of the Maya pantheon. The Jade Head, which became known as the Crown Jewel of Belize weighs 9.75 pounds, stands almost 6 inches high, and is representative of an era between AD 600 and 650. Coins can be purchased at the Central Bank of Belize during specific opening hours, Monday through Fridays. For more information please contact the Central Bank of Belize at telephone number 223-6194.